Once the pump arrives on site the operator will liaise with the contractor /customer before setting up the pump and pipeline. The operator will then park it in an accessible place. If required polythene (to be supplied by the customer) will be placed onto the floor to reduce the amount of mess from spillage. 2. The concrete mixer truck will arrive and reverse onto the pump. 3. The ready mix lorry will then be positioned to enable the discharge of concrete into the hopper of the pump. 5. The operator can begin to pump the concrete onto the site. 6. The concrete will be placed into position using the boom where possible. 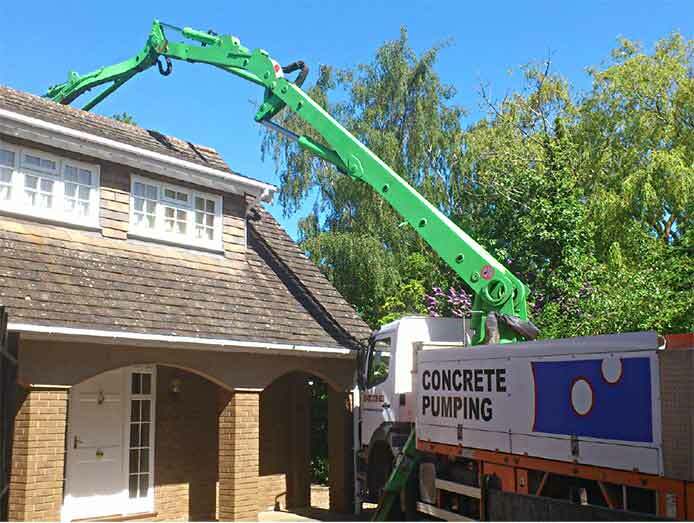 Due to the technical requirements of the concrete pump and the pipe-work involved the order of placement of the concrete will be at the discretion of the pump operator. When the truck mixer has discharged its load, the mixer chutes will be cleaned before the mixer leaves. The chutes should not be washed into the hopper as this could cause a blockage and affect the quality of the concrete. The next mixer will then arrive reverse on to the pump and discharge its load this is repeated until the pour is complete. Once the concrete has been placed on site the concrete pump operator will empty the hopper and blow out the pipes with compressed air. This will deposit the concrete that remains in the pipes onto the site. The pipes will contain approximately 1 wheelbarrow of concrete per 25 feet of pipe. The pump will then need to be washed out this preferably takes place on site but a no wash out on site option is available at extra cost. He will then clean out the hopper this will leave a minimum of two wheelbarrows full of concrete, which again will need to be deposited on site. This operation will take approximately one hour, more if the job involves a long pipeline. A pump operator will then put the boom back into its travel position and load all the ancillary equipment onto the pump. The job sheet will then be prepared for the contractor to sign. The pump will then leave site and travel back to the depot. 1. Concrete is pumped at high pressure. All personnel should be made aware of the risks and dangers associated with end hose usage. 2. Under no circumstances should any unauthorized person attempt to open or unblock the pipeline or operate the pump or ancillary machinery. 3. All site personnel involved in placing the concrete should observe the normal precautions for handling cementitous materials. 1. A good pump mix concrete, your ready mixed concrete supplier will advise. 2. 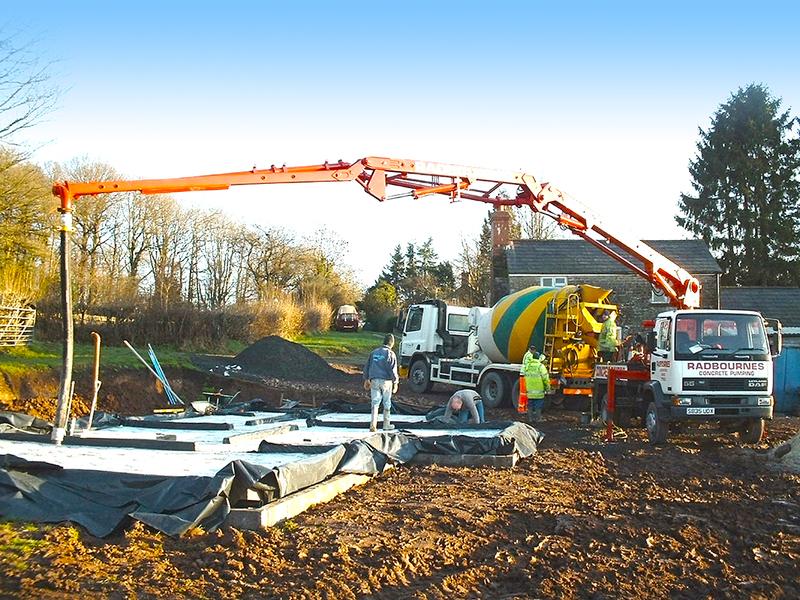 The minimum cement content for a pump mix is 270kg per cubic metre this can increase dependant on the distance that the concrete is required to be pumped; this must be specified when ordering and pricing the concrete, as these figures will exceed the normal cement content of some mixes and will affect the price. 3. The minimum slump (wetness) that will pump is a 100 slump. Any concrete below that slump will not pump satisfactorily and will require water to be added which will dilute / weaken the strength of the concrete. 4. A level area of hard standing, with no overhead obstructions, on which to set up the pump. 5. Clear access to the pump for the truck mixers. 6. Somewhere to deposit excess grout. 7. A competent concreting gang to lay the concrete. 8. A suitable place for the operator to wash the pump out at the end of the job. 9. A good supply of water will help the operator; thought the pump does carry its own supply. If you are looking for ideas to transform your garden, why not have a look at the projects below. Our customers are never short of ideas how to make the most of our products, and it's great to see them come to life in such an exciting way, so be inspired! Now that Summer has finally arrived, the days are getting longer, the sun is shining, and our minds start to focus on the great outdoors – more specifically, the jobs that need doing in the garden! It’s time to visit Radbournes - they have everything you need to create your ideal garden! 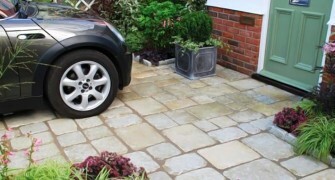 Radbournes have everything you need to create your perfect garden, from slate chippings; cobbles and setts; woodchips and mulches through to patio pavers. Based in Hereford, we deliver throughout the UK.